Merced River, originally El Río de Nuestra Señora de la Merced ("River of Our Lady of Mercy" in Spanish). 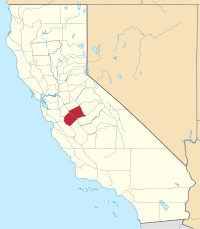 Merced County (/mərˈsɛd/ mər-SED), is a county located in the northern San Joaquin Valley section of the Central Valley, in the U.S. state of California. As of the 2010 census, the population was 255,793. The county seat is Merced. The county is named after the Merced River. Merced County comprises the Merced, CA Metropolitan Statistical Area, which is included in the Modesto-Merced, CA Combined Statistical Area. It is located north of Fresno County and Fresno, and southeast of Santa Clara County and San Jose. The county derives its name from the Merced River, or El Río de Nuestra Señora de la Merced (River of Our Lady of Mercy), named in 1806 by an expedition headed by Gabriel Moraga, which came upon it at the end of a hot dusty ride on the El Camino Viejo across the San Joaquin Valley in Spanish colonial Las Californias Province. Merced County was formed in 1855 from parts of Mariposa County. Parts of its territory were given to Fresno County in 1856. According to the U.S. Census Bureau, the county has a total area of 1,979 square miles (5,130 km2), of which 1,935 square miles (5,010 km2) is land and 44 square miles (110 km2) (2.2%) is water. The 2010 United States Census reported that Merced County had a population of 255,793. The racial makeup of Merced County was 148,381 (58.0%) White, 9,926 (3.9%) African American, 3,473 (1.4%) Native American, 18,836 (7.4%) Asian, 583 (0.2%) Pacific Islander, 62,665 (24.5%) from other races, and 11,929 (4.7%) from two or more races. Hispanic or Latino of any race were 140,485 persons (54.9%). As of the census of 2000, there were 210,554 people, 63,815 households, and 49,775 families residing in the county. The population density was 109 people per square mile (42/km²). There were 68,373 housing units at an average density of 36 per square mile (14/km²). The racial makeup of the county was 56.2% White, 3.8% Black or African American, 1.2% Native American, 6.8% Asian, 0.2% Pacific Islander, 26.1% from other races, and 5.7% from two or more races. 45.3% of the population were Hispanic or Latino of any race. 6.6% were of Portuguese and 6.0% German ancestry according to Census 2000. 55.1% spoke English, 35.3% Spanish, 3.2% Hmong, 2.9% Portuguese and 1.0% Punjabi as their first language. There were 63,815 households out of which 45.4% had children under the age of 18 living with them, 57.8% were married couples living together, 14.1% had a female householder with no husband present, and 22.0% were non-families. 17.7% of all households were made up of individuals and 7.4% had someone living alone who was 65 years of age or older. The average household size was 3.25 and the average family size was 3.69. In the county, the population was spread out with 34.5% under the age of 18, 10.3% from 18 to 24, 27.9% from 25 to 44, 17.8% from 45 to 64, and 9.5% who were 65 years of age or older. The median age was 29 years. For every 100 females there were 99.3 males. For every 100 females age 18 and over, there were 96.6 males. The median income for a household in the county was $35,532, and the median income for a family was $38,009. Males had a median income of $31,721 versus $23,911 for females. The per capita income for the county was $14,257. About 16.9% of families and 21.7% of the population were below the poverty line, including 28.4% of those under age 18 and 10.7% of those age 65 or over. As of 2008, according to the Lao Family Community, a nonprofit organization, about 8,000 Hmong lived in Merced County. Merced County is a California Constitution defined general law county and is governed by an elected Board of Supervisors. The Board consists of five members, elected by districts, who serve four-year staggered terms. The Merced County Sheriff provides court protection, jail administration, and coroner service for the entire county. It provides patrol, detective, and other police services for the unincorporated parts of the county. The main sheriff station and offices are at Merced. There are two sheriff's substations. A Grand Jury report in 2010 stated that the Sheriff processed 12,746 average jail bookings per year with an average daily jail population of 1,123. Municipal police departments in the county are: Merced, population 83,000; Los Banos, population 38,000; Atwater, population 30,000; Livingston, population 13,000; Gustine, population 6,000; Dos Palos, population 5,500. In the United States House of Representatives, Merced County is in California's 16th congressional district, represented by Democrat Jim Costa. In the California State Legislature, Merced County is in the 21st Assembly District, represented by Democrat Adam Gray, and the 12th Senate District, represented by Democrat Anna Caballero. Merced County voted for the winning candidate for president in every election from 1972-2012, before voting for Hillary Clinton in 2016. Democrat Barack Obama won a majority in the county in both 2008 and 2012. Republican George W. Bush won a majority in the county in both 2000 and 2004. According to the California Secretary of State, as of October 20, 2008, there were 97,179 registered voters in Merced County. [citation needed] Of those, 44,704 (46.0%) are registered Democratic, 35,955 (37.0%) are registered Republican, 3,090 (3.2%) are registered with other political parties, and 13,430 (13.8%) declined to state a political party. Atwater and the unincorporated areas of Merced County have Republican plurality registration advantages. All of the other cities and towns in the county have Democratic pluralities or majorities in voter registration. Merced County grows 90% of California's sweet potato crop, due in part to the efforts of John Buttencourt Avila, called "the father of the sweet potato industry". Merced County Transit, or "The Bus," provides local service in Merced as well as connecting service between most cities in Merced County. The University of California, Merced, operates its own transit system, Cat Tracks. This system connects with Merced County Transit. Yosemite Area Regional Transportation System, or YARTS, connects Merced with Yosemite National Park. Greyhound buses and Amtrak trains provide long-distance intercity service. Merced Regional Airport, located two miles (3 km) southwest of downtown Merced, provides passenger air service. General aviation airports in the county include Castle Airport, Gustine Airport, and Los Banos Municipal Airport. The population ranking of the following table is based on the 2010 census of Merced County. The former Castle Air Force Base and the United States Penitentiary, Atwater are located in an unincorporated area near Atwater. ^ "Merced County". Geographic Names Information System. United States Geological Survey. Retrieved January 31, 2015. ^ "Merced County, CA - Official Website - County Executive Office". www.co.merced.ca.us. Retrieved 2016-05-30. ^ "Laveaga Peak". Peakbagger.com. Retrieved January 31, 2015. ^ "Merced County, CA Zip Codes". Zip-Codes.com. Retrieved May 29, 2016. ^ U.S. Census Bureau. American Community Survey, 2011 American Community Survey 5-Year Estimates, Table B19301. American FactFinder. Retrieved 2013-10-21. ^ U.S. Census Bureau. American Community Survey, 2011 American Community Survey 5-Year Estimates, Table B19013. American FactFinder. Retrieved 2013-10-21. ^ U.S. Census Bureau. American Community Survey, 2011 American Community Survey 5-Year Estimates, Table B19113. American FactFinder. Retrieved 2013-10-21. ^ U.S. Census Bureau. American Community Survey, 2011 American Community Survey 5-Year Estimates. American FactFinder. Retrieved 2013-10-21. ^ Oppenheim, Jamie. "Hmong youth not preserving traditions, professor says Archived June 8, 2010, at the Wayback Machine." Monday March 29, 2010. Retrieved on September 20, 2010. ^ "Board of Supervisors". Merced County, CA. Retrieved January 5, 2015. ^ "California's 16th Congressional District - Representatives & District Map". Civic Impulse, LLC. Retrieved March 1, 2013. ^ Leip, David. "Dave Leip's Atlas of U.S. Presidential Elections". uselectionatlas.org. Retrieved March 16, 2018. ^ "Major Employers in California". www.labormarketinfo.edd.ca.gov. Retrieved March 16, 2018. ^ Promotions, Center for New Media and. "US Census Bureau 2010 Census". www.census.gov. Retrieved March 16, 2018. Wikimedia Commons has media related to Merced County, California.